The Women of Color in Computing Researcher/Practitioner Collaborative connect diversity, data, and tech from an intersectional perspective. In 2018, a report resulted from this effort: "Data Brief: Women of Girls and Color in Computing." The report tells the following story of a field in which disparity and disproportion are pervasive. Technology, global in scope, can amplify economic growth. Integral parts of the tech workforce include computing and information technology occupations. These occupations offer substantial economic benefit to their holders. But, the computing sector has a problem. This sector's demographic makeup skews the non-representativeness when compared to the United States' diversity. Lack of diversity underpins a need to extend tech-specific occupational opportunities to groups at society's margins and build a workforce with diverse talent and potential. For example, "Black and Latinx women . . . are the fastest growing group of entrepreneurs in the United States." But, vast underrepresentation siloes this potential. So, more needs to be done to unlock diverse talent. Enhancing inclusion and opportunity for marginalized and diverse groups requires a nuanced perspective. In this context, considering the interlock between gender and racial/ethnic background is critical. Intersectionality looks at how forces like racism and sexism overlap to impact individuals, groups, and communities. For example, intersectionality may involve uncovering diversity issues by looking at college enrollment statistics for various combinations of race/ethnicity backgrounds and gender identities: White men, Latinx women, persons who identify as Black and non-binary, and other combinations. An intersectional perspective can expose disparities that start early in the life course. Factors like low participation in high school advanced placement computer science classes among Black, Latinx, and Native American girls—coupled with zero Black and Latinx girls even being in such courses in 13 states-may set the stage for disparity at later points in life. A look at post-secondary education completion rates unveils the sequelae of early disparity. The disconnection between women of color's post-secondary enrollment versus computer science bachelor's degree completion is stark. Disproportion at the post-secondary level can trigger decreased participation in the tech workforce. Decreased participation is a reality. National Science Foundation data show that "among all women employed in computer and information science occupations, 56% are White women, 32% are Asian women, 7% are Black women[,] and 5% are Latinx women." Silicon Valley magnifies racial/ethnic and gender disparities: "In Silicon Valley, men constitute 70% of the workforce, Asian and White women comprise a combined 26% of the professional workforce, while Black, Latinx, and Native American/Alaskan Native women each constitute 2% or less." 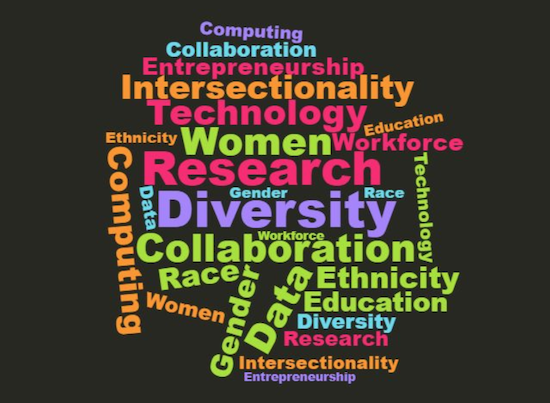 Without the participation of women of color in the creation of new technology enterprises, products[,] and solutions, women of color will be excluded from opportunities to develop and invest in products intended to solve pressing challenges facing diverse communities, develop wealth in salary, equity, and investment returns, and decrease widening inequality. Cultivating a "tech ecosystem" conducive to women of color's success in computing requires a transformational approach—one that first builds an empirical and theoretical foundation through data and research. Strengthening the base of research and data may prove vital in creating a context that holistically does the efforts of marginalized and diverse communities justice. Julio Montanez is a former staff writer for WITI (Women in Technology International). He has a bachelor's degree in political science and sociology from the University of Central Florida. Julio hopes to one day be a university professor.